It’s that time of year again. The time of year when every where you turn it seems like Spring Cleaning is what everyone is talking about! 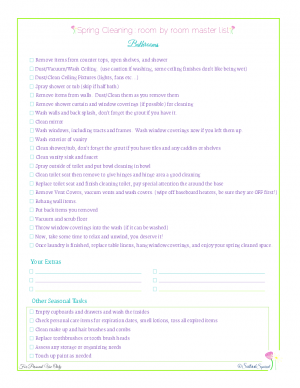 I’m still not sure where I stand on Spring Cleaning this year, but I’ve been giving it an awful lot of thought as I’ve been busy making up some Spring Cleaning Checklist to share with you all. I’ve already shared some of what I found out about Spring Cleaning in this What Works for You post. 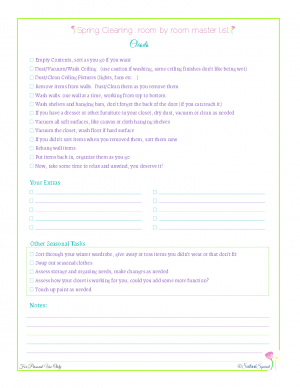 So, I won’t rehash it here, but I just wanted to say that that post helped me create the printables below. I tried to cover as much ground as I could, and make a few different options that, hopefully, you will find helpful. 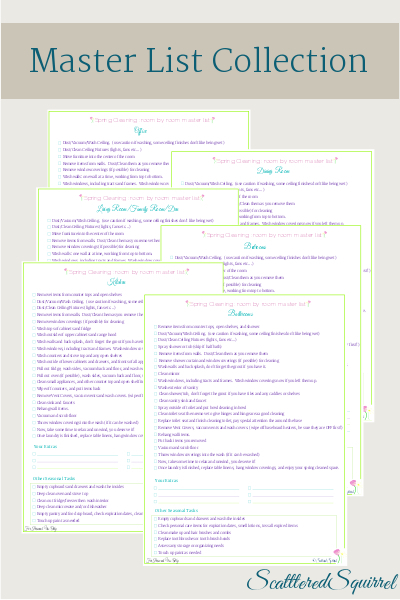 First up… the master checklists! These I made for those of you who love to give your homes a good deep cleaning. Each page is a different room or area in your home, and is broken up into three parts. 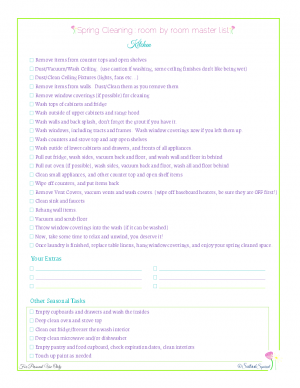 The master list of things to do, a space for you to include your own items, and some extra seasonal tasks you could do. 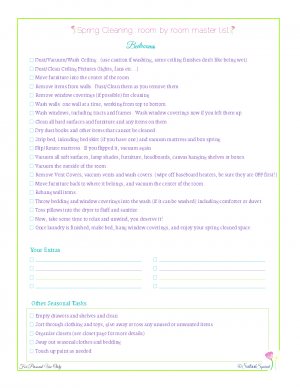 The nice thing about these lists, is that you can either use them to bust through your spring cleaning in a week or two, or you could assign one room per week or month. You could also use them if you are moving. Just skip the parts that say “put items back” and pack up your stuff as you go. If you want all the rooms, just the click the picture above and you can download the zip folder. As you can see there are seven areas or rooms. I deliberately skipped two, the laundry room and the mudroom/entry. Because these areas differ greatly from home to home, I wasn’t sure how to make up lists for them. Some homes the laundry is in a bathroom, or there is no mudroom just an entry way, that isn’t really a room. If you really want one for those areas drop me a line in the comments and I’ll make some up! To snag individual rooms just click the pictures above. Now, I know the above lists are not for everyone. First, not everyone wants to get that detailed in their spring cleaning, and second, not everyone likes to work on one room at a time. I know that for me personally, I work better by focusing on one task at a time. For instance, when I vacuum I vacuum the whole house, or a least one whole floor. I find I’m more likely to get it done, when I do it that way. This next printable was designed along that train of thought. As you can see this one is a little different. Down the left hand side is a list of tasks, across the top is a list of rooms and areas. I left some extra blank spaces along both so you could add your own to it. (Would you like a totally blank version of this? 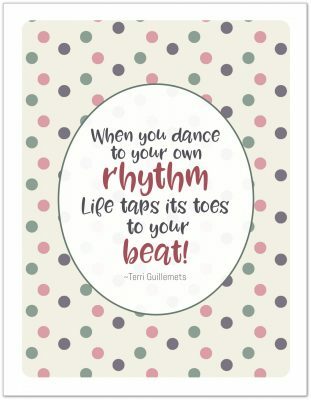 Let me know in the comments) This printable could be used a few different ways I’m sure. You could use it to tackle one job at a time, or simply to track what you’ve done in what room, and I’m sure there are other ways to use it too that I haven’t thought of. If this one is more your speed, click the picture to snag a copy for yourself. 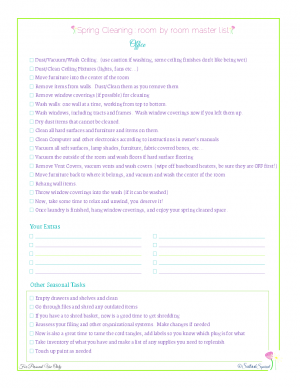 I have one more Spring Cleaning list to share with you. I made this one thinking of all the people I know who are just too busy with life to spend a week or more spring cleaning, but they still want to do something. If you fall into this category, then this printable might just be what you’re looking for. As you can see, this one is pretty simple. Just some basic, seasonal to-do’s. 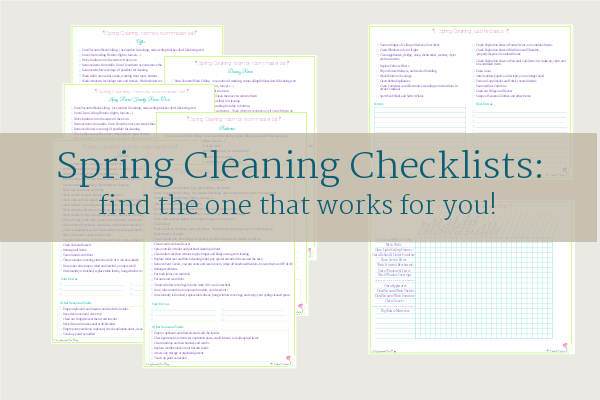 More of a reminders list than a cleaning list, though there are some cleaning items on there. You could probably incorporate most of these items into your regular cleaning routine, spread them out over a couple of weeks and you’ll hardly notice them, but you’ll feel the difference. If this is closer to your cup of tea, click on the picture to grab yourself a copy. 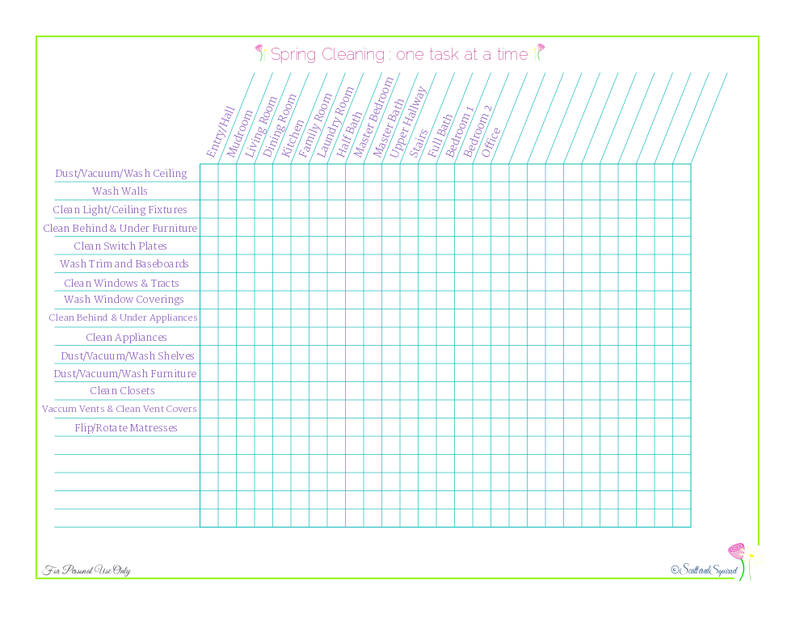 So there you have it, three different lists (or rather two different lists and a collection) to help you with your spring cleaning. No matter what kind of spring cleaning you’re gearing up for this year. 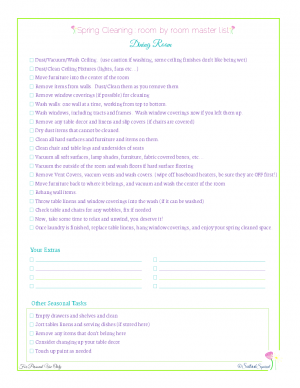 As for me, I’ll share my spring cleaning plan on Friday! 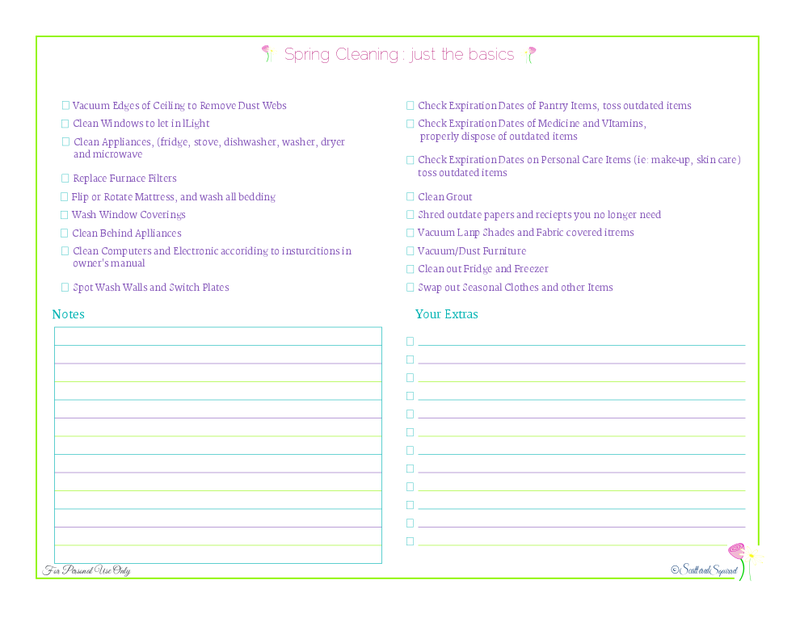 So, are you jumping on the Spring Cleaning Train this year? If you were only going to worry about doing one thing, what would it be? It is that time of year again. So even though this is an older post I still love it. Thank you for sharing!